Pope Francis will travel to Cuba in September ahead of his visit to the US, the Vatican has announced. 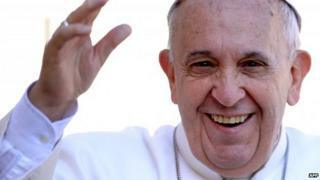 In a statement, it said the Pope would be in Cuba on "the invitation from the civil authorities and bishops of Cuba". The pontiff is credited with helping bring about last December's diplomatic thaw after the decades-old enmity between communist Cuba and the US. The US imposed had imposed a trade embargo soon after Cuba's 1959 revolution led by Fidel Castro. In the statement, Vatican spokesman Father Federico Lombardi did not provide details how long the Pope's visit would last. The 78-year-old Argentine pontiff will be the third pope to travel to Cuba, following visits there by John Paul II in 1998 and Benedict XVI in 2012. "The presence of His Holiness in Cuba will be memorable," Cuban Foreign Minister Bruno Rodriguez said. "He will receive the warmest hospitality of the Cuban people." The Roman Catholic Church has maintained relations with Havana since the revolution. It also organised a series of secret diplomatic meetings to broker the US-Cuban rapprochement. The talks directly involved Pope Francis. The pontiff himself is no stranger to Cuba - he was there during Pope Benedict XVI's visit, the BBC's David Willey in Rome reports. He is also the author of a book on Cuba. After Cuba, he will continue his journey to Washington, New York and Philadelphia. He is expected to address a joint session of US Congress and will also speak at the UN.